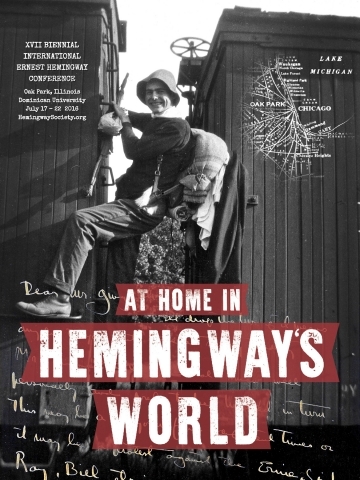 The Hemingway Society, the Ernest Hemingway Foundation of Oak Park, and Dominican University are thrilled to announce their partnership in hosting the 17th biennial international Hemingway Society conference at Hemingway’s hometown of Oak Park, Illinois. Conference participants will enjoy excellent presentation venues at Dominican University, beautiful event venues in Oak Park and River Forest, including the birthplace and the North Kenilworth home, and opportunities for exploring the Art Institute, the Newberry Library, and other historic Chicago sites. Participants are encouraged to join The Ernest Hemingway Foundation of Oak Park in celebrating Hemingway’s birthday with the community the weekend following the conference. Participants will be coming from 18 countries: Albania, the Bahamas, Canada, China, France, Germany, India, Iraq, Israel, Italy, Japan, Macedonia, the Netherlands, Serbia, Spain, Switzerland, the United Kingdom, and the United States. Novelist Tim O'Brien, author of Going After Cacciato (National Book Award), The Things They Carried, and In the Lake of the Woods, will deliver a keynote Tuesday evening talk. Conference participants have free admission; the general public can purchase tickets for this event here: An Evening with Tim O'Brien. Documentary filmmakers Lynn Novick (director), Sarah Botstein (producer), and Geoffrey C. Ward (writer), all longtime collaborators of Ken Burns, will discuss their creative process as they embark on a documentary biography of Hemingway. The film, co-directed by Burns and Novick, is a production of Florentine Films, and will air on PBS in 2020. Parallel programs will offer opportunities for teachers seeking continuing education and for undergraduate Hemingway scholars in a one-day symposium. To register for the one-day Teaching Hemingway in-service program and receive state-approved professional-development credits please complete this Teaching_Hemingway_Registration_Form. Dominican University's Rebecca Crown Library has assembled online resources related to the conference theme: Library Resources. Spread the word, stay tuned for more information, and we hope to see you in Oak Park!